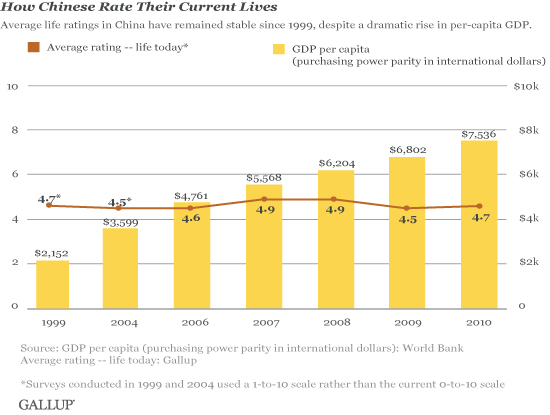 China’s system of gov’t is based not on a mandate from the people, nor does it rely on a mandate from heaven (which was the Chinese version of a divine right to rule), instead the current system relies on quality of life improvement spurred by China’s growing GDP (my post on the problem with those numbers) for their mandate to rule. 1950’s Civil war ends and life expectancy increases as people finally have safety and regular access to food. China is able to launch massive infrastructure projects. 1960’s Great Leap Forward, followed by millions of deaths in the great famine. This destabilizes China forcing the government to relax some controls on collective farming, but also harshly punishes critics. 1966 begins the Cultural Revolution as quality of life remains relatively flat or worse. 1970’s Cultural Revolution continues until 1976, only ending when thousands of urban youth are sent to work in the countryside. Mao dies and Deng comes to power along with his policy of opening up. 1980’s China grows rapidly for nearly a decade under the new market reforms, but near the end of the decade the economy stagnates with nearly 20% inflation (my post on inflation). It is at this moment that students gather in Tian’anmen Square for democracy and are joined by workers from throughout the city. 1990’s China’s economy begins to grow in ways beyond what most could imagine, opening up new lives to hundreds of millions of people. The economy only faced minor setbacks during the Asian financial crisis, partially because of its previous isolation. 2000’s Growth continues at record rates. In late 2007 high inflation sets in, partially due to high oil and food prices. This was subdued with nationalist spirit for the upcoming Olympics (in my town students were required to participate in mock Olympic torch parades through the city every week). So we can clearly see that there is a relationship between stability and improvement in quality of life (Note that it is not enough simply to maintain a moderate quality of life). So the big question would be: Does GDP growth related happiness suffer from diminishing returns? According to this Gallup survey, the answer seems to be a resounding “Yes”. Which is terrible news for the Communist Party. Imagine you are a 40 year-old living in China today. You were born during the Cultural Revolution, and have seen GDP per capita increase from $118 to $4,394, a 3,700% increase. You remember a time when just owning a bicycle was a luxury. Private property was not just completely unavailable, but even discussing the possibility could brand you a counter-revolutionary. Compare that to China’s post-90’s generation, who grew up as the only child in their family, spoiled by grandparents. As we’ve talked about before, owning a car and apartment is now considered a prerequisite for marriage, even though minimum wage has only increased slightly from the time you started middle school. And while your parents probably never owned a land-line telephone, you now own multiple cell-phones. Not only are your expectations higher, but gone is the free housing and heavily subsidized food. Improving the standard of life currently enjoyed by those living in China’s biggest cities will prove to be a major challenge, but reducing the growing inequality between rural and urban salaries is an even more pressing issue. In the countryside life satisfaction has actually decreased over the last decade. In the next 10 years it will become increasingly difficult for the Party to maintain its power simply through consumer comfort, since their demands are increasing much more rapidly than their salaries. It seems that when the goods the masses desire are out of reach, the stability on which the Party’s foundation rests begins to crumble. By T in Economy & Development on August 16, 2011 . When that economic legitimacy runs out, there’s not much else but good old fashioned nationalism. That might be when the dog gets wagged and we see China’s military picking up the slack in the South China Sea or maybe even Taiwan. That might be when the dog gets wagged and we see China’s military picking up the slack on the square again more probably than in the South China Sea or maybe even Taiwan. Nothing lasts forever, that includes the so called holy democracy. You are correct, nothing lasts forever, which is why I’m talking about the next few decades. Also nobody said that it had to be Western Democracy, I said that explicitly in the post. I understand your points, but I hope you’ll read more carefully in the future. Great post, it reminds me those days in 1980s when Chinese trying the best to keep ends meet. But in China “more or less” is not the biggest concern, we care about “不患寡而患不均”, which means uneven distribution is the toxic of society. Nowadays comparing to the inequality between rural and urban area, clashes between social classes raise more serious problems.